One of the benefits of building solutions in the cloud is the flexibility that is gained from having numerous technologies at your disposal. This blog post overviews the usage of SQL Database as a spoke in a hub-and-spoke architecture with SQL Data Warehouse. Data warehouse solutions exist to represent a clean integrated data set representing core business functions. The clean data is then used for reporting and data analytics. Reporting data is generally scoped to certain time windows, such as the last year or year’s worth of data in aggregate form. Data analytics is ad-hoc, and is over far more granular data. If you would like to scale-out the reporting of aggregate data in a performant cost-effective fashion, our integration between the two services with elastic query provides the ability to manage a hub and spoke solution on a global scale. 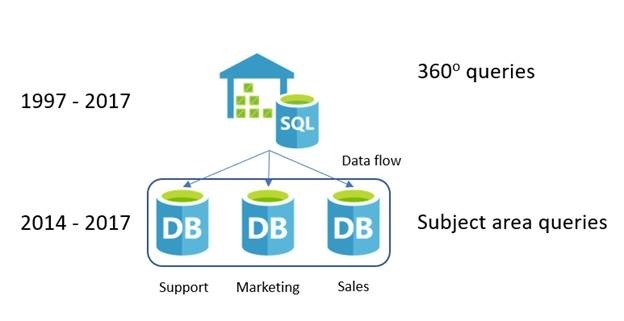 Store your hotter/aggregate data in highly concurrent SQL Database instances to serve reporting data while maintaining direct connection to SQL DW to harness the power of massively parallel processing (MPP), and the ability to store far greater amounts of data! The example in the above diagram shows a data warehouse solution with the subject area SQL Database instances, which offload and maintain the more recent subject area data for fast reporting and insight. For users that need more data, they can always access the data warehouse data through elastic query. For the power users and data scientists, the data warehouse remains the source of truth for 360o analysis of the business. If you’d like to explore creating a SQL Database as a spoke, consider deploying the template below. 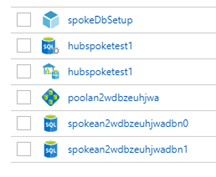 This template will deploy on a pre-existing SQL DW instance and will create a defined number of SQL Database spoke instances with all external tables referencing the SQL Data Warehouse tables pre-created based on a control table. The template deploys a user defined number of PremiumRS SQL Databases in an elastic pool, automation account, and a runbook. Deployment Guid: A GUID for the Runbook Deployment. This must be unique per deployment. There are several services online to generate a GUID. The deployment timing varies based on the number of databases provisioned and the number of tables in your SQL Data Warehouse. After deployment, you should see an automation account, runbook, elastic pool, and SQL Databases. Once everything has been deployed, verify that all the external tables, views, and stored procedures have been created. You should see several objects under the meta schema, within both the SQL Data Warehouse and SQL Database. Within each SQL Database, you should find the meta.RemoteTableDefinitionView followed by an external table definition for each table within your SQL Data Warehouse. Query one of the generated external table and validate that you can query from your SQL Database to your SQL Data Warehouse instance. Visit our documentation to learn more about hub and spoke architecture and elastic query. This template is a sample to help accelerate and demonstrate hub and spoke with SQL Database and SQL Data Warehouse. Specifically, this sample is used to demonstrate control tables to manage DB Elastic Query access, and generating external table definitions. 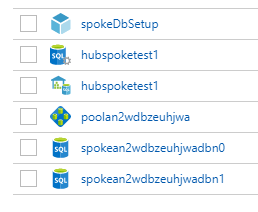 Please stay tuned for more information on how to manage the materialization of data in these DBs to create a true concurrency reducing hub and spoke solution. Visit our GitHub to view and learn more about the code sample. We recommend that you alter the code samples to fit your needs before deploying to a production system.